The Diablo III 2012 wall calendar has some awesome artwork. Each piece that has been chosen for a particular month is definitely worth more than just the typical glance that people give their calendar’s when they need to add information to it. This blog is a continuation of the series I am doing about the artwork that is featured for each month in this year’s calendar. I probably should have found time to write about “Ms. April” in April, but, clearly, that didn’t happen. You see, in April, there was this little thing happening that perhaps you heard about. It was called the Diablo III beta, and it took up all of my free time. I figured I’d have time to write this later on in the month, and it couldn’t hurt to play the beta for one more hour, one more night, one more level. Once we learned that the beta was ending at the end of April, well, that became my focus. I’m certain I’m not the only one who couldn’t stop playing the beta. The class that I spent the majority of my time playing in the beta just so happened to be the one that was featured on the calendar in April. There she stands, right in the center of the action, crossbows in each hand. Her eyes glow with hatred from beneath her black hood. On her back is a quiver filled with arrows, ready to be used to kill anything that crosses her path. This could be none other than the Demon Hunter. Behind her, a demon with several arrows sticking out of him falls to his death. On her other side, a demon with two large, curved, horns on his head, screams in agony. He has been shot in the head with an arrow, and another sticks out of his shoulder. 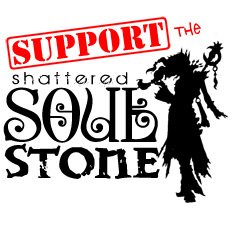 He might not be dead, yet, but his fate is sealed. Oddly enough, this demon seems to be wearing about the same amount of armor as “Mr. March”, the Barbarian who was featured on the calendar in March. In the background, there is a bright orange glow. 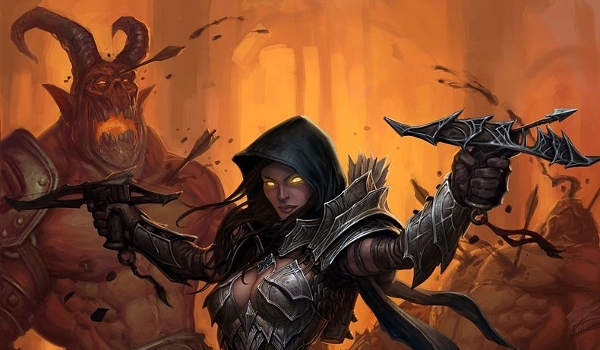 Is the Demon Hunter fighting in Hell, or, has her hatred colored the way she sees the world around her? Perhaps it is both. The artwork you see at the top of this article is not, exactly, what appeared in the Diablo III calendar. What you see here is the same piece of artwork, however, it has been cropped into a rectangular shape that would not easily fit into the square shaped wall calendar. The cropped version does a pretty good job of capturing the action in the artwork. Shortly before Diablo III launched, Blizzard did a countdown, of sorts, that included something called “Darkness Falls, Heroes Rise” For a limited amount of time, you could create a customized banner for each of the five playable classes of Diablo III. 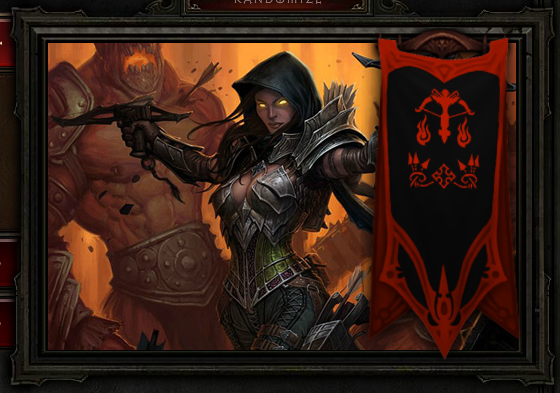 Blizzard started with the Demon Hunter class, and used the artwork that appeared in April in the Diablo III 2012 wall calendar as the background art for the Demon Hunter’s banner. Want to know more about “Ms. April”, the Demon Hunter? I recommend that you watch this video that Blizzard created about the story behind the Demon Hunter class.